Not everybody has the same internet speed, but not everybody can purchase the same internet speed, either. The three major contributors to the speed of any network are where you're located, what you're paying for, and how you're using the internet. The United States doesn't have equal internet speed across every state and provider. In-town customers usually have their pick at a variety of internet service providers while rural users are stuck with just one or two options. Another area where internet speed can be measured is for mobile users. Most cell phone providers offer a data plan for customers to access the internet on the go, and the speed you're allotted depends on where you are when you access the mobile network and what kind of device you're using. If after testing your internet speed you find that it's slower than what you're paying for, there are some things you can try to make the connection faster. However, the speed of any network can only be as fast as what the internet service provider (ISP) is giving out. It's impossible to put a number on what's consider the normal speed of a network's internet connection. Everyone pays for a different speed and uses different devices, on different networks, to access the internet. However, it is possible to determine your specific definition of normal by testing how fast of a connection you have and comparing that to the speed you're supposed to be getting. With that being said, it's definitely much more common to get faster speeds on wired connections than wireless. For example, your phone probably can't stream movies while camping as quickly as it can at home. Similarly, if you live in the outskirts of a bigger city and rely on a satellite for internet, you're likely not getting the same quick speeds as people in town. Average connection speed for mobile phones ranges from 14 Mbps to 34 Mbps depending on the state where you live, the age of your phone, and whether your equipment supports the 4G LTE standard. All major cellular providers show somewhat slower speeds in rural areas, no doubt because 80 percent of the population lives in urban areas. In most cases, the speed differential is less than 10 percent. However, these are averages; some users experience faster speeds and some slower speeds. In 2018, Wyoming had the slowest average cellular internet speed and Washington, D.C., had the fastest. 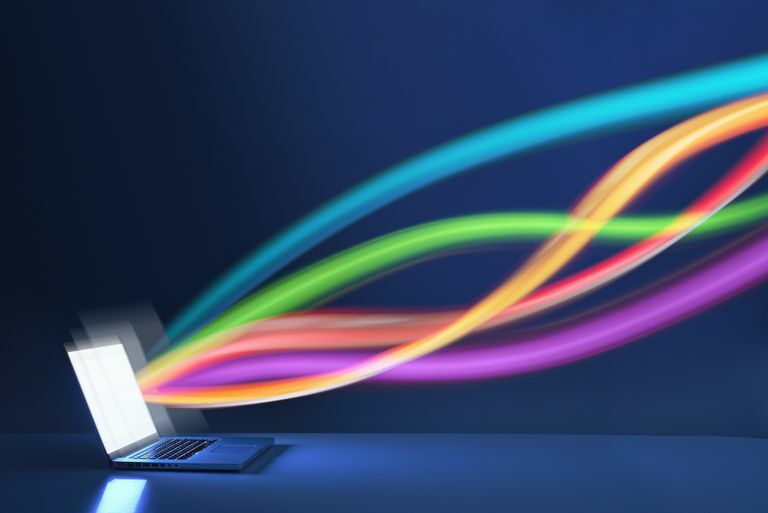 Modern broadband cable, fiber, and DSL networks continue to increase their internet speeds. In 2018, Comcast's XFINITY promised speeds up to 2 Gbps, while AT&T offered 1 Gbps speeds to subscribers. Typically, unless you're with one of these services, you can expect to see download speeds in the 50 Mbps to 150 Mbps range, with upload speeds much slower. Finding out how fast of an internet connection you have is fairly are. There are lots of internet speed test sites that will do it for you in a matter of minutes, like Speedtest and SpeedOf.Me. One catch is that you have to make sure you're performing the speed test against your own ISP. For example, even if you don't subscribe to Comcast's internet package, you can still test your internet speed with the Comcast speed test for a somewhat accurate result. However, if you plan to argue with your ISP about why you have slow internet, you'll need to use a speed test they approve of. If you can't find your own ISP in the list of speed test sites above, contact your internet service provider and tell them you want to test your internet speed. There's a good chance they have a speed test you can perform to instantly see if you're getting what you're paying for. However, it's important to remember that there's a lot that goes into the speed of a network. You could very well be getting exactly what you're paying for but not fully realizing it because your network is being overworked. There's more on that below. If your internet speed seems to be falling short of the theoretical maximum set by your ISP, consider all the different variables at play. Network congestion: If you're sharing the network with other users, specifically ones that play online games, stream Netflix and YouTube, broadcast live video, and download lots of large software programs, you'll experience a slowdown. Have the other users pause their downloads, streams, or uploads, or have them install an app with bandwidth control. The less bandwidth that's being split between all the users, the more bandwidth that each individual user will have, which translates to faster internet for everyone. Your location and distance from the server: Particularly for people in rural settings, the more distance the signal travels, the more your data hits bottlenecks across the many hops to reach your device. If you're gaming or streaming movies, switch to a closer server (if that's an option). Hardware: Hundreds of pieces of hardware connect you to the web, including your network connector, your router and modem, many servers, and many cables. Also, a wireless connection has to compete with other signals in the air. Check the connections that you can in your network (router, cabling, etc.) to be sure they're attached properly. Replace the router or modem if it's too outdated to perform well. Change your wireless router's channel number to avoid interference. Time of day: Like the roads during rush hour, the internet has peak times for traffic that contribute to speeds slowing down. Put off streaming and downloading until off hours like during the day Monday through Friday. Selective throttling: Some ISP's analyze data, and purposefully slow down specific types of data. For example, many ISP's limit connections that are downloading movies or will dial down everything if you consume more than your monthly allotment. Use a VPN provider to obfuscate your data so that the ISP can't detect your habits and throttle your bandwidth. Software: You may unwittingly have malware or a bandwidth-intensive application running that robs your internet speed. Shut down the bandwidth-hogging application and/or scan for malware. If after satisfying all of the above solutions, your internet is still slower than you think it should be, your only option is to upgrade. You can get faster internet by calling your ISP and requesting the next tier in their plan (if there is one). However, before upgrading your internet service, do one last speed test with all of the above in mind. Keep network activity to a minimum, switch over to wired only, etc., and if the speed is within 5 to 15 percent of the service's promised speed (which is normal), an upgrade may be your only solution. On the other hand, if you pay for a 150 Mbps connection, and you're getting 44 Mbps, it might seem like a perfect time for an upgrade, but you should first contact your service provider to audit your connection. If they mistakenly toggled you at a slower speed, the provider should give you what you paid for or credit you back fees.